The vision of the seamless passenger journey is to reduce routine agent involvement, and ICM’s Series 7 Auto Bag Drop (ABD) does exactly that. It is intuitive, non-intimidating and easy to use, designed for the infrequent flyer to operate without agent assistance. ICM’s Series 7 ABD is leading the way in airport self-service baggage solutions, and deserves this award because of its superior design and advanced technology. The airport check-in experience is usually one that takes up a significant amount of time for passengers, much of which is spent in queues. Most travellers spend on average up to four minutes checking in for a flight (not including queue-time). This process usually consists of several customer service agents sat behind individual desks, with a managed queue that snakes around the designated check-in zone for that airline. Airports and airlines benefit from ICM’s Series 7 ABD units as they enhance terminal capacity, lower operational costs and improve the passenger experience. A faster check-in saves passengers time, giving them more time to shop inside the airport. It also saves airlines money and resources, and increases airport revenue. ICM’s Series 7 ABD units are always available and do not depend on the number of customer service agents on shift. ICM’s Series 7 Auto Bag Drop (ABD) eliminates terminal congestion by way of its function and design. The ABD design better utilises space that is traditionally taken up by check-in desks, providing more room for passengers to comfortably manoeuvre luggage, trolleys and wheelchairs. One customer service agent can easily monitor a whole row of units, only stepping in to assist if passengers need help. It also eliminates congestion in front of the ABDs, improving accessibility as passengers are free from cross traffic. The contemporary design of the Series 7 ABD unit adds to the aesthetics of any airport terminal. From the rounded edges of the console to the use of lighting and glass, the shape and style of the Series 7 ABD unit is modern in design and pleasing to the eye. As the passenger approaches the ABD unit, they are prompted to touch the screen to start, and place their bag on the belt. The ergonomic design has the belt positioned to the side, promoting easier side loading, only requiring a gentle lift to get luggage onto the belt. They are then required to scan their boarding pass, which begins the passenger lookup on the airline database. 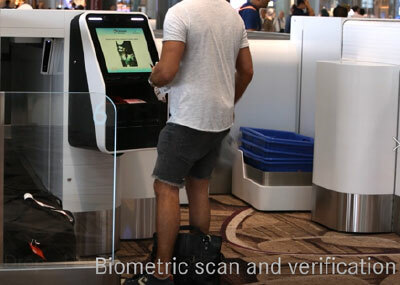 For international travel, the passenger is prompted to scan their passport which is verified, and then to look at the biometric cameras which confirm their identity. Simultaneously, the bag is being validated for size, weight and conveyability. The passenger confirms their flight details, the bag tag is activated and the bag is dispatched. The bag drop process is now complete.This process on average takes under 35 seconds for the non-biometric bag drop process, and approximately 60 seconds for biometrically-enabled bag drop process. The Auto Bag Drop unit uses sophisticated technology to facilitate a completely automated self-service process. Advanced 3D scanners detect non-conveyable items which prevent Baggage Handling System snarl-ups. ABD units are equipped with a sophisticated 3D imaging system that accurately analyses the baggage. This feature is configurable to the airport/airline requirements and ensures that only conveyable bags are accepted. Bags that are upright, multiple bags, round bags or bags with straps etc., will be detected and an appropriate action will prompt the passenger e.g. to use a tub. Once the passenger places a bag on the first belt, a Dynamic Virtual Box is activated, creating an exclusion zone that surrounds the bag, adjusting to its specific size and shape. Anything that enters the virtual box (e.g. the passenger’s hand) will halt moving conveyors ensuring passengers are always safe from moving parts. This prevents bag weight tampering and ensures the accuracy of baggage weights so that excess baggage fees can be accurately applied. Dual light curtains detect intrusion by persons or objects entering the Baggage Handling System. This prevents any unexpected intrusions into the Baggage Handling System, ensuring uncompromised security and safety. Biometric verification (face, fingerprint, iris etc) is seamlessly integrated to confirm the passengers’ identity. 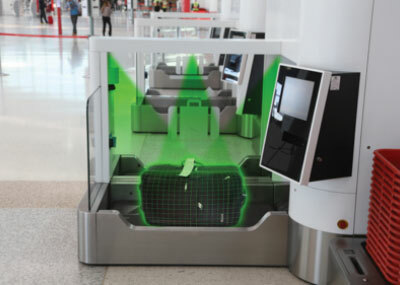 ICM was the first company to roll out face-to-passport biometric validation for self-service bag drop in the world (at Auckland Airport in December 2015). What ICM’s Auto Bag Drop does that no other competitors do? A challenge in the emerging self-service market today is that many of ICM’s competitors are claiming to do the same things as ICM e.g. detection of non-conveyable baggage items (upright bags, multiple bags, strap bags, tub detection etc.) and intrusion detection (similar to our dynamic virtual box) when in fact their products often have inferior performance. 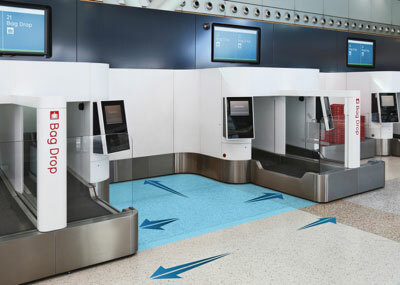 The performance of self-service bag drop systems is a key factor in the efficiency of the passenger terminal, which is why it is important to adopt a consistent approach when evaluating them. The logic behind this is outlined in the attached supporting documentation ‘Case study: Performance Matters’ written by Dr Tom Landgrebe and Rainer Dinkelmann of ICM Airport Technics which was published on passengerterminaltoday.com on 21 June 2018. Patents have been granted and in some cases are pending for various innovations in the Series 7 Auto Bag Drop range. One of the biggest strengths of the Series 7 ABD unit is that we can freely ask potential clients to visit any of our deployment sites, and simply observe day-to-day operations and watch the magic happen, unadulterated and unsupervised. Where can you find ICM’s Series 7 Auto Bag Drop units? Automated Bag-Drop machines allow passengers at Changi Airport to enjoy the flexibility of checking in their bags at their own convenience. Fast and Seamless Travel enhances operational efficiency and redefines the passenger’s travel experience. We’re proud to have partnered with ICM on this significant transformation of our passenger experience, operational efficiency, and ultimately the operational capacity of our T1 International terminal. 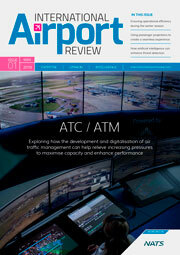 ICM’s solutions have underpinned a considerable improvement in passenger throughput, especially at peak times.